Optuma is a powerful analytical software platform targeted towards market professionals and highly disciplined private investors. Our clients range from Wall St departments, buy and sell side Analysts, Portfolio Managers and Traders. They choose Optuma because of the advanced techniques, deep technical analysis, incredible publishing, quantitative exploration and unique portfolio analysis. Optuma has all the standard single code chart styles that you would expect. Bar, Line, Candle, Point & Figure etc. 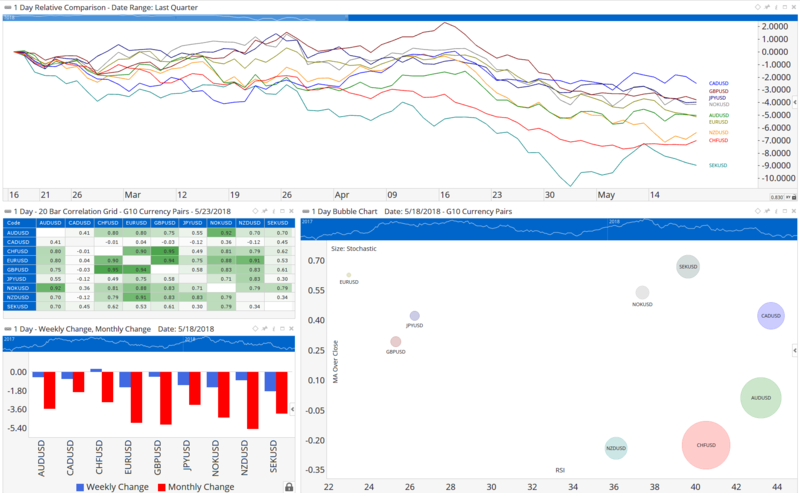 You also get access to unique charts like Swing Charts and Seasonality Charts (pictured). By “Single Security” we mean that it is a chart that is calculated on the price history of a single security. Every chart is designed in a logical way to give you easy control. Want to change the time-frame from 1 Day to 1 Week? Just click on the “1 Day” in the heading and choose the time frame that you want. If you are like most Analysts, your job is review and rank multiple securities. We can’t invest in every security, so how do we choose? 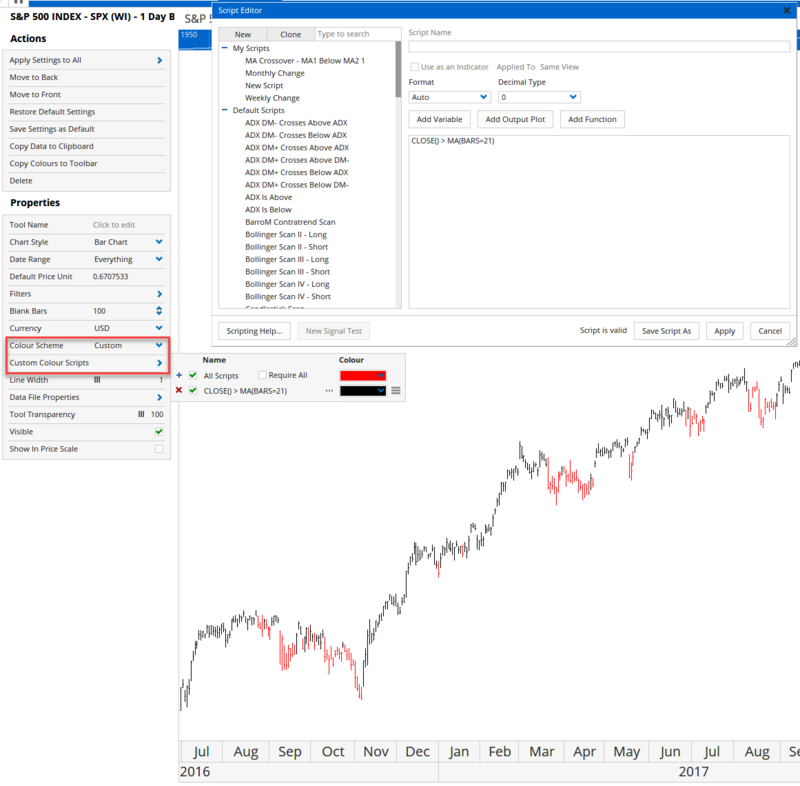 Optuma gives you access to a number of advanced charts that take a basket of securities and compares them. A lot of these charts allow you to build a dashboard that looks a lot more like Business Intelligence rather than Security Analysis. 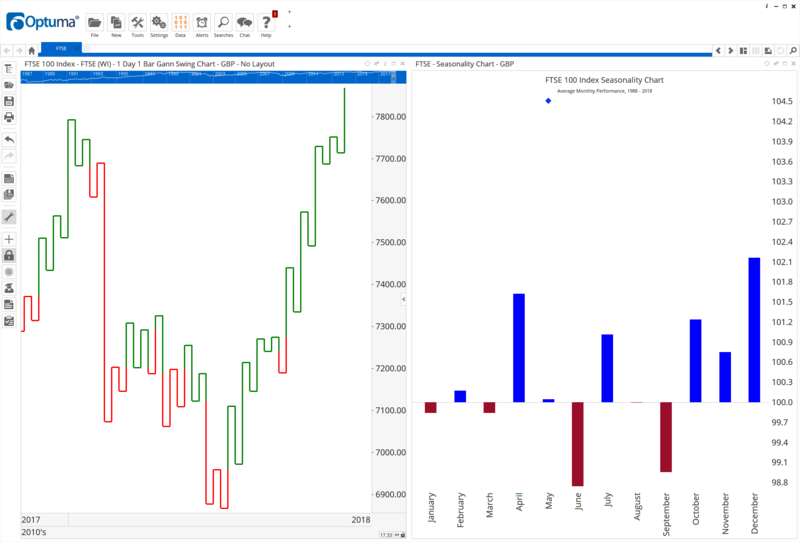 In Optuma you will be able to create Bubble Charts, Column Charts, Scatter Plots and of course Relative Rotation Graphs. Many of these charts you will not find anywhere else. Our goal at Optuma has been to give you the flexibility and power to explore your own ideas. You need to have the freedom to be able to merge ideas together and to see if creates a new discovery. The only way we were going to be able to give that to you was if we created a scripting language that was simple to use but powerful enough that it let you explore all your ideas. Optuma can easily be used with point & click to open up charts and add technical indicators, allowing you to avoid any scripting at all. But if you want to get the most out of Optuma, then you will need to learn all you can about scripting. Nearly every aspect of Optuma can use scripting, from chart colours to alerts & scans to the quantitative testing tools. You owe it to yourself to learn how to use these simple scripts. We have two resources to help anyone who wants to learn scripting. The first is a video course on our education site called learn.optuma.com. 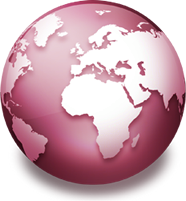 The second is a user based forum where Optuma users ask questions on how to build scripts. 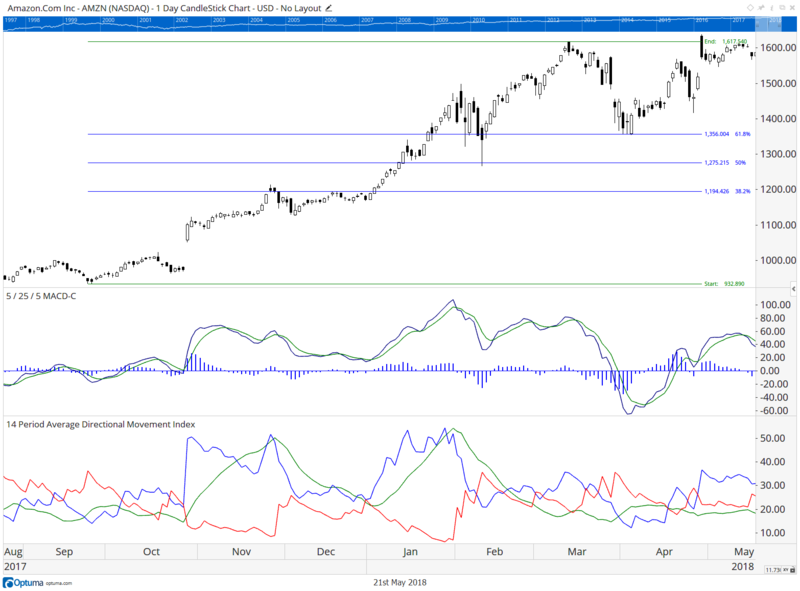 At Optuma we are huge supporters and believers in Technical Analysis in all its variations. From the objective quantification of momentum ideas, through to subjective Trend Line or Gann analysis. Every technique has its place and its suitability depends on what your goals and style are. If you were trading a handful of securities, then the more subject forms of analysis are great. But if you are needing objective rules so you can explain your risk profile to potential investors, then you will focus on that area. No matter how you approach the market, Optuma has the most advanced tools ready for you. 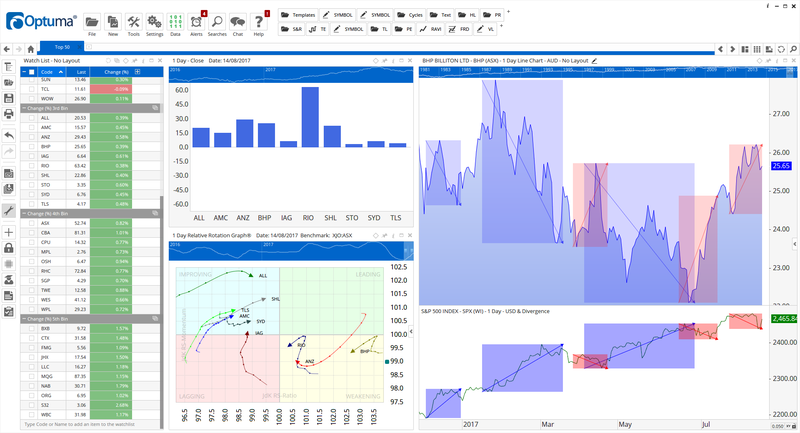 Every edition of Optuma comes with all the standard indicators that you would expect (like RSI, Stochastics, Averages, Oscillators and MACDs) plus much much more. Over 200 built in indicators that you can use. If you want more, then there are many modules that can be added on to extend the tools that you have. And that is on top of the scripting that allows you to create an unlimited number of custom indicators. 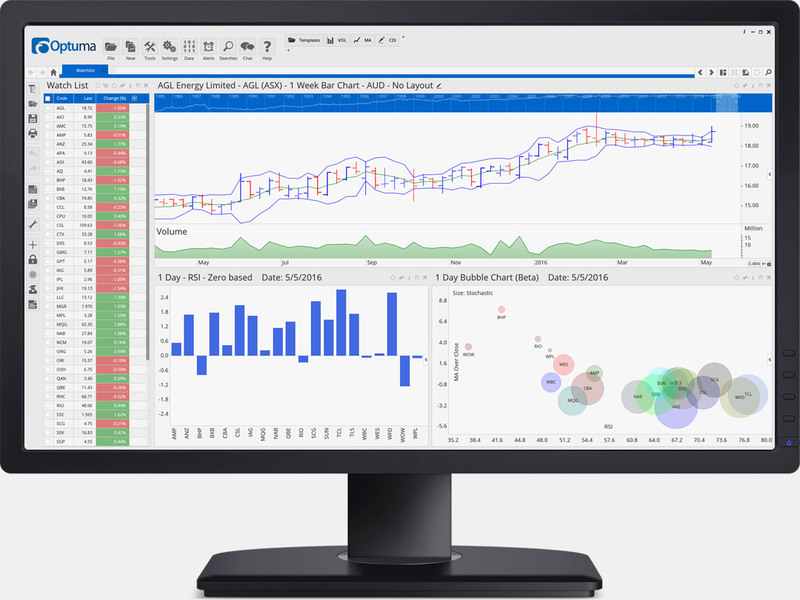 We pride ourselves on building the premier Technical Analysis software solution. in fact, our Founder is the only person in the world who teaches all levels of CMT preparation for professionals who are taking one of the three CMT exams. Our dedication to Technical Analysis means that you can have confidence that you are choosing the world’s best —and most accurate— Technical Analysis platform. With so many opportunities to pick from, you often need your tools to be able to monitor the market for you and let you know if there are any securities that match your criteria. With Optuma you can use the Scanning Manager to quickly search through thousands of securities and short-list those which match your criteria. If you link that scan to a Watchlist then it gets run automatically every time you open the watchlist. There is no easier way to keep you eye on the whole market. 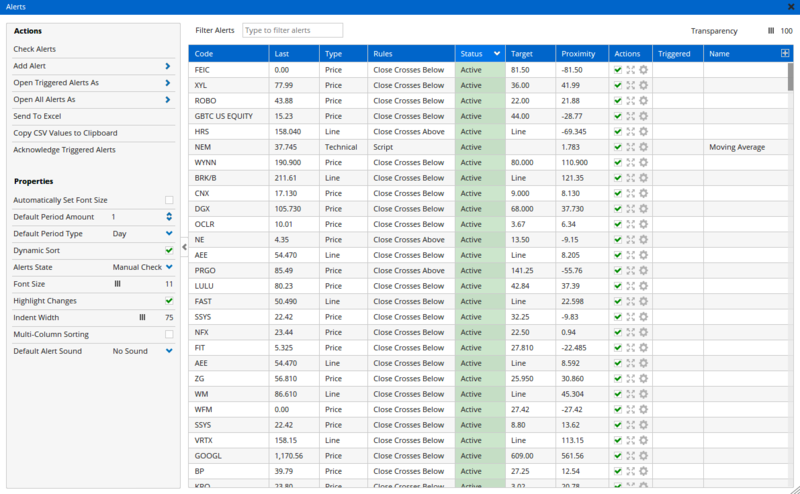 Alerts let you monitor individual securities. This is no simple price alert though, in Optuma you can have complex technical alerts too. Have you ever been waiting for a security to break through an angled trend line? or even a particular level on an indicator? Well in Optuma you can do all that and more. Once you have identified your alerts, Optuma will keep monitoring them —using end of day or real-time data, which ever you are using— and will let you know as soon as they are triggered. Do you have a database of old data in csv format? 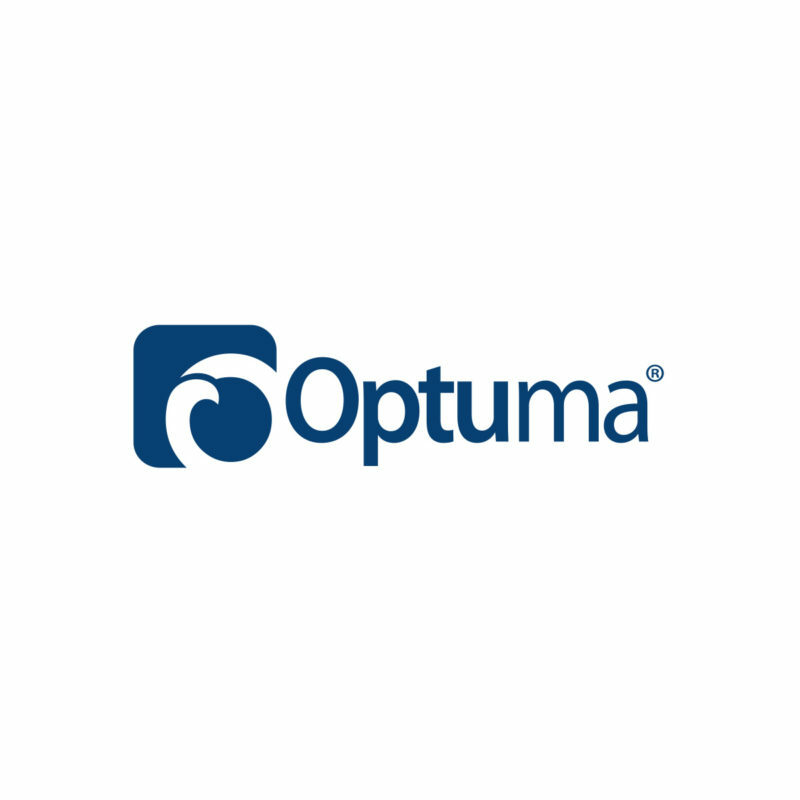 Optuma can read that too—and other end of day formats like Metastock and CSI. No matter what your data needs are, either Optuma or our partners will be able to help.